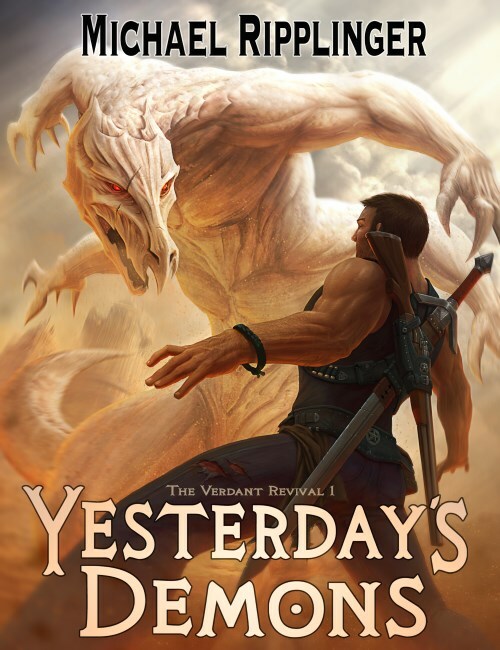 Want to win a free paperback copy of Yesterday’s Demons? I’m giving away five copies via a Goodreads.com giveaway. It is proving to be a more popular giveaway than I’d expected. If you already own the book, but you know someone who’d be interested in receiving a free copy, please let them know about the giveaway and ask them to enter. I can’t wait to send out these free books. The giveaway ends on February 15. At this time last year, I posted a 2015 recap of the progress I’d made on that “become a published author” project I’d been working on. With the new year now upon us, it’s a good time for me to reflect back on 2016 and see how similar Plan and Reality ended up. Here’s what I had planned for 2016, followed by when I checked the item off my list… or when I didn’t. The pre-order went live on March 10, and the book was released on April 12. There’s really nothing else that I can consider my professional highlight of the year. This was a dream come true. If you haven’t bought it yet, check out the shopping links in the sidebar or on this page. On April 22, newsletter subscribers were the first to learn this was now available. At this point, I exclusively read ebooks. But I learned that plenty of folks still prefer books made out of atoms instead of bits. And as my friend William Munn recently put it, he’s come to see a dead tree copy of a book as a collectible. So this was also a big milestone, and a true highlight of the year. For purchasing links, again see the sidebar or this page. After releasing Yesterday’s Demons in ebook and paperback, I spent the remainder of 2016 head down writing its sequel. I had hoped to have a near-final draft of that book in the hands of my editor by the end the year, but life got in the way. I transitioned to a new day job, which was great for my mental health but bad (for a while) for my productivity. But the biggest problem I had in finishing by my self-imposed due date was that I struggled with the book for a while. I don’t know if I’d call it “writer’s block” so much as I’d call it “writer’s doubt.” For a while, I just wasn’t certain I was writing something that was Not Crap. In the end, everything came together into something I’m proud of and excited about. This is the news that newsletter subscribers got earlier this week: on December 31, I completed the first draft of The Verdant Revival, Book 2: Tomorrow’s Shepherd. This time I chose a bowl of Frosted Flakes with some fresh strawberries and blueberries and, because it was Christmas and because my wife is an amazing Italian, I garnished it with some struffoli on top. These are the two items that were on my 2016 checklist that I did not accomplish. At some point last year, I opened my 2016 annual plan notes, found the “finish the first draft” item, and added in red ink: “This seems wildly unrealistic.” Sadly that turned out to be true. But though I didn’t get as far as I hoped, I ended up with a work I’m wildly enthusiastic about. I’m an artist; I’ll take quality over deadlines any day. So what’s next? I’m still formulating my complete 2017 plan, but I can say my number one goal for the year is to have Tomorrow’s Shepherd on sale by the end of the year. I’m going to work hard on that one, because I can’t wait for you to read it. I’ve mentioned that each of the three books in The Verdant Revival will feature a different main character: first Siv, then Fritz, and finally Cassie. What I haven’t mentioned before is that each book also has a different theological virtue at its core. Yesterday’s Demons was about love, the opposite of fear. The finale will be about faith. And Tomorrow’s Shepherd is about hope. So while I wish I would have finished the book’s first draft sooner, there was something special about completing it during the Christmas season — the ultimate season of hope. On April 12 of this year, I released Yesterday’s Demons, and all of you have shown me so much support by buying the ebook and the paperback and by leaving reviews on Amazon and Goodreads. Y’all have made me feel like George Bailey on Christmas Eve. So today I have a holiday treat for you: a holiday-themed short story prequel to Yesterday’s Demons. You can read “The First Lenerstelen Without You” on this site right now. I wrote this story in December 2014. That month, my writing group’s monthly prompt was “holiday story.” I tossed a few ideas back and forth, but I couldn’t find one I really liked. (Although I know I have a Santa Claus story in me, I just haven’t come up with the idea yet.) That December, I’d been listening to a lot of Sixpence None the Richer’s Christmas album, The Dawn of Grace, and I was particularly enamored by “The Last Christmas Without You.” The song is a beautiful letter from a mother to her unborn child in which the mother sings to her baby about this last Christmas she is about to experience before her baby is born. But its opening guitar riffs have a haunted quality that felt a little out of place with the joyful nature of the rest of the song — and those riffs are the ones I kept humming over and over. Those melancholy melodies and a title idea inspired by the song’s title gave me the seed of a story. I realized I had a chance not just to describe a holiday on planet Verde, but to explore Siv’s youth and some of the choices he made that made him into the man we meet in Yesterday’s Demons. When you become a Goodreads author, a few “Ask the Author” questions are automatically placed in your queue. Two of them are “How do you get inspired to write?” and “Where did you get the idea for your most recent book?” I think this is because people are fascinated with writers’ imaginations. Everyone wants to know if that character is based on a real person, or what prompted the author to make the story take place in the 1700s, or OMG how in the world could you have let that happen to my hero?! You can read my answers to the questions above on Goodreads.com, but I’d like to go more in-depth on this topic because I love talking about it… and because a friend and writing group colleague of mine, KM Alexander, has started #My5 — a familiar format for authors to share their inspirations. So without further ado, here are five influences on my first novel, book 1 of The Verdant Revival, Yesterday’s Demons. Before Phantasy Star, I liked fantasy, and I liked science fiction, but there was a line between the two. To my 13 or 14-year-old self, fantasy was about swords and sorcery and medieval times, while science fiction was about laser guns and spaceships and the future. Phantasy Star destroyed that line. It featured heroes who wielded both swords and laser guns. In it, I traveled to castles in the sky and to distant planets. Some obstacles were overcome with magic keys; others with high-powered, high-tech ice diggers. It might not have been the first story to blend these worlds. It might not have even been the first console RPG to do it. But Phantasy Star was the first time I experienced this kind of mash-up. That innovative mix didn’t just hook me from the start, it became my favorite kind of world to escape into. It is no mistake at all that Yesterday’s Demons takes place in a world with a similar mix of genres. Final Fantasy VII is rightfully remembered as the most popular RPG of the late 1990s, and I liked it a lot. It probably would have been the sixth item on this list if this were My6 instead of My5. But it wasn’t my favorite RPG of that era. That honor goes to Wild Arms. Ahh, Wild Arms… how I love thee! In the late 1990s, my beloved Phantasy Star series had come to an apparent close and I was in search of new games to fill the void. From the first day I saw it on the Vidpro wall at Toys “R” Us, Wild Arms filled that void, built a home, and tunneled its way into a very special place in my world. It has all the heart and soul, and fantasy and science fiction, that I loved about Phantasy Star. But it also added a new element: an Old West-style world, complete with gunslingers and ten-gallon hats. I can directly attribute the Western-like setting of Yesterday’s Demons to my love of Wild Arms and its planet, Filgaia. Yeah, yeah, a fantasy novel was inspired by Tolkien — how shocking. But it’s actually not what you might think. Tolkien’s influence on Yesterday’s Demons does come from his status as the godfather of fantasy, of course. But Yesterday’s Demons was also influenced by the one-two punch of Tolkien’s dislike of allegory and his Catholic worldview. But while no one would call Frodo Baggins “the Jesus Hobbit,” Frodo’s role as the Ring-bearer parallels Christ’s role as the sin-bearer. There are shades of Simon of Cyrene in Samwise Gamgee, especially when Samwise helps a beaten and exhausted Frodo bear his burden for a short time. And the OneRing was destroyed, and evil thoroughly conquered in Middle-Earth, on March 25, the day on which Christians celebrate the Annunciation of the angel Gabriel to Mary — the day on which Christ was conceived in His mother’s womb. Tolkien’s Catholic faith was deeply important to him, and it was impossible for him to separate it from his work. He didn’t use allegory, yet his stories were inevitably and undeniably infused with Catholic morals and a Catholic worldview. And that’s pretty much exactly what I hope people will say about my own work. How in the world do old “true crime” TV shows from the 1980s like Unsolved Mysteries and Rescue 911 influence a fantasy, SF, Western novel? Some of my grandmother’s favorite shows were what we’d now call “true crime TV.” I watched many of them with her, even though they often scared the pants off of me. I was afraid to visit the restroom during an Unsolved Mysteries commercial break for fear that a criminal or alien would be standing at the window watching me. Rescue 911 gave me recurring nightmares that someone had broken into my garage. And when the annual Unsolved Mysteries Halloween episode aired featuring ghost stories? Whoa no! I didn’t sleep for days. Fast forward to my earliest thoughts about the story that would become Yesterday’s Demons. I knew I wanted to write a fantasy, SF, Western novel. But I also knew I wanted it to be about fear — how fear controls us in ways both good and bad, how it can be both healthy and maddening. And you know what they say: write what you know! Thanks to all those paranoid fears and nightmares brought on by my grandmother’s true crime TV shows, I knew old friend fear far too well. I moved to Texas in 2007 and I’ve never looked back and I never will. I love it in God’s country. Since Yesterday’s Demons was published, friends have told me they saw some of our mutual friends in the book’s protagonist, Siv McCaig. And they’re right… all of them, no matter which mutual friend they mentioned by name. In many ways, Siv is an amalgamation of every Texan I’ve met since living in the Lone Star State. I have a good friend who laughs the loudest at his own jokes. I have a pair of mentors who are brothers who always refer to their father as “our father”… except when they’re talking to each other, in which case he’s always “Daddy” — and these are big, tough, barbecuing Texans. Siv wears boots and jeans and when he’s planning to do something, he says he’s “fixing” to do it… just like every native Texan I know. So that’s it… or rather, that’s the big five that came to mind the fastest. If you like any of the items listed above and you haven’t yet given Yesterday’s Demons a try, I think you’re missing out. Yesterday’s Demons is on sale now! Today’s the day! Yesterday’s Demons is available for immediate download from your favorite ebook retailer. If print books are your thing, bear with me a little longer. The print edition will be here I hope (crosses fingers) by the end of the month. And my fingers were crossed in a good luck way, not in an “I’m lying but it’s OK because I crossed my fingers” way. What is Yesterday’s Demons all about? Meet the book’s main characters: Siv, Cassie, and Fritz. After you read it, please write an honest review of it on your preferred platform. Amazon and Goodreads are great places for that. If you didn’t like it, tell me why. If you did like it, well I know for a fact the Internet needs that information. But don’t worry, you’re going to love it.